Walking into the MaltCave, before learning that the pourMeister had splashed the Glenmorangie Signet into glasses, it was easy to believe that John’s Persian slave boy had laid out a gourmet cheese spread for us, including room temperature Veritable Chaumes, Epoisses, Caraway Tilsit, Raclette, and Venezuelan beaver cheese. My mouth was watering, imagining that soon I’d also be eating roasted filberts out of a waxed brown paper bag, an as-yet unknown Willy Wonka bar consisting of milk chocolate pockets housing crème brûlée and mistakenly-added cologne-soaked rags somehow gone missing from the Oompa Loompas’ locker room. As I entered the Signet-redolent room, it took me back to the time Stephen encouraged me to participate in a regression experiment in which psychologists encouraged me to symbolize my passage out of the birth canal by streaking naked through artfully-arranged-into-a-delta curtains of buttered scrim and black shearling onto the Caber toss field during a Highland Games. Mamma! Mammmmaaa! Once I realized that, in fact, it was not another regression experiment or cheese spread that awaited me, I drank, it seemed, a vial of blood poured into my mouth by Angelina Jolie…just before she ground out her Davidoff cigar on my tongue with the stiletto heel of her Manolo Blahnik shoe. (Brad Pitt, I’m sorry I besmirched your honor.) Pain and pleasure in equal doses, compounded by chili-infused cocoa nibs: Billy Bob Thornton helpfully poured me a glass of Aztec Warrior Elixir from the Kakawa House in Santa Fe. (Mmmm. Some folks call it a Singapore Sling blade.) Jon Voight served me a plate of grilled asparagus amandine sprinkled also with small cubes of sugared bacon. A meditative finish, pondering if I was actually William Hurt in Altered States, or maybe John Milton discovering a new circle of Hell in which the damned are condemned to eat nothing but bacon wrapped in smoked bacon, skewered with toothpicks of bacon. Actually, that sounds more like Heaven to me, and despite the Signet’s transubstantiative properties, I’m still everyone’s favorite Impostor, Liza Minelli. The Glenmorangie Signet is the first lip-lock with a true love–You might write goopy poetry, or you might write Der Ring des Nibelungen, but you’ll never forget, and never exactly remember just how F*CKING AMAZING it was. 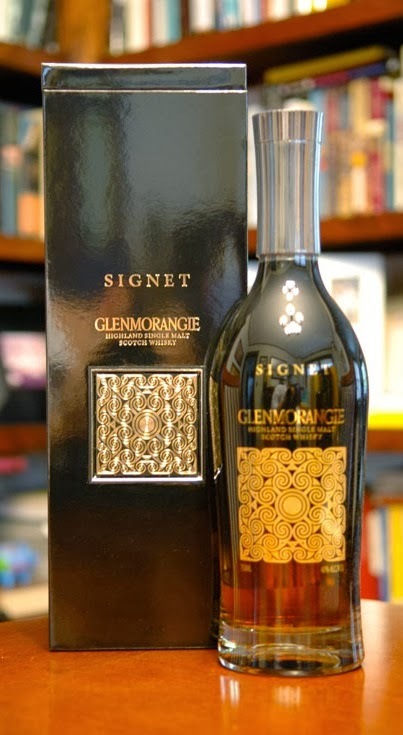 –Our thanks to David Blackmore and Glenmorangie for the sample! Ahh… Venezuelan Beaver Cheese. And here I was reasonably confident that I’d escape the day without casting a gaze upon its reference.